Crossroads Cycling Adventures organized the 3400 mile cross country bike trip I did from LA to Boston in 2009. I loved this trip. The adventure, seeing the country, the eat all you can and still lose weight was special. But what was most special was bonding with my fellow riders. When Crossroads announced a reunion ride and XC09ers Bob, Champ, Hank, Jack, Jim, Peter, and Tom signed up I excitedly sent in my application. We begin in Maine on Sept 22, bike 21 days, for a daily average of 76 miles. There are 25 riders including my friend Larry from Ann Arbor. On the last day of the ride I was having breakfast with Jim. He says to me "Every morning I would say to myself, slow down, it is not a race. But you know what, it is a race". Well, Jim and Peter were arguably the fastest riders on XC09. When I began in LA I was an inexperienced rider. It took me two weeks to get experienced enough and fast enough to ride with them and we rode together almost daily over the last five weeks. They are safe, strong, aware, and just enjoy riding. As I explained to Mike, proprietor of the most knowledgeable and friendly bike shop anywhere, Aberdeen in Chelsea: "This is a reunion ride. There will be the fastest riders from other years. This could get ugly, a king of the hill kind of deal. I had enough trouble keeping up with Jim. What happens when Jim is racing someone that rides considerable faster he did on XC09"? Mike's advice: "Start an hour after everyone else on the first three days. That way no matter how hard you try you will know you can't catch them. Let them tire themselves out then ride with them on the fourth day. And get in good shape". Good advise. But will I follow it? I did get in pretty good biking shape. My competitive sport is Orienteering. I did not ride much in 2010 and ran my last O race on July 31. I started serious biking on August 2, but was able to ride 1700 miles in the last six weeks. But what is this? Can it be true? "Big Dogs" are the fastest riders on any bicycle tour; they're the ones who arrive first at the hotel each day. While these bike "tours" are not races, some of the participants will be Type-A personalities who will push as hard as they can. 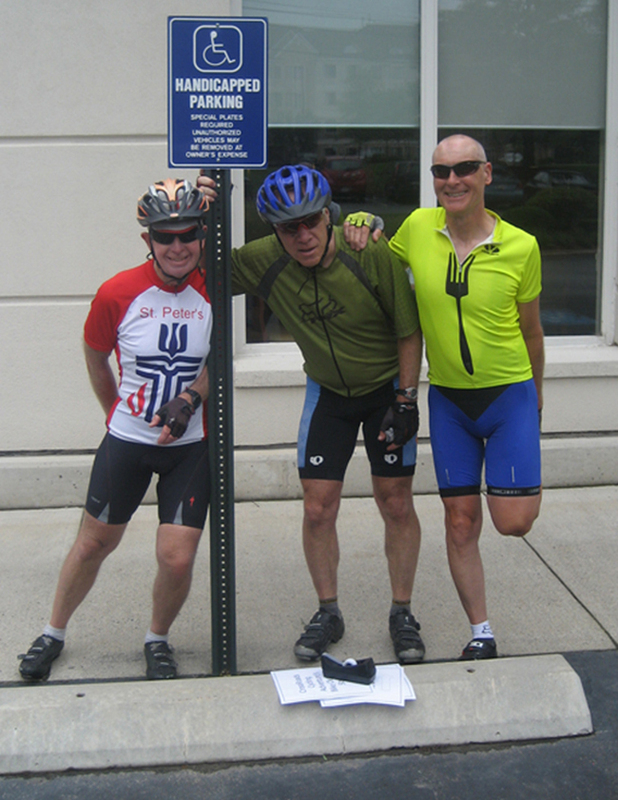 I have to admit, when I rode across the country in 2009, I was one of the BDs. I started out with good intentions but my competitive spirit soon overcame my better sense. This trip, I hope to relax a little more to enjoy better the ride and the camaraderie - taking my time, stopping to take pictures, and interacting with the locals at every opportunity. What? My goal on this trip was to try to keep up with Jim and Peter. If they stop and smell the roses, what will I do? Jim, Al, Peter after just finishing the XC ride. This is really cool! After my bike accident both my parents, esp. my dad- are anti-bike people. Hard to conceive of fathers biking long distance - what a brilliant route! Best of luck Mr. Newman!! Be safe!! Well Al, good luck Big Dog. My bet is on your inherent competitive nature and wisdom will be a distant second. Having said that, I do wish a you a Great Ride! Envy doesn't cover my feeling on this. The best way to be a Big Dog and keep up with Jim and Peter is to start 1 hour ahead of everybody else! I wish you the best and will follow your blog with interest. We are on our way back from FL now, but we did the trip in an RV. Oops, that's probably a bad thing. Have a wonderful trip. This is slightly more sane than the last time but still pretty crazy. Wonderful to see another bike trip developing. I vote for at least a few days of taking it easy and smelling the flowers. Gett'r done & back in time to enjoy Michigan's continued undefeated football season! Enjoy & have fun on your adventure Uncle Al! Very sound advice from Mike in Chelsea - remember, its a marathon, not a sprint. Will you follow it? I wish!